Pearson Test of English is a computer based language proficiency test, which evaluates the four crucial language skills- Speaking, Writing, Reading and Listening. It is similar to IELTS and TOEFL in purpose, yet differs in its pattern and structure. Without any human involvement the complete test is conducted in one go on the computer. The test score is universally accepted in Australia for study as well as for settlement purpose. It is now widely accepted at many colleges/ universities in Canada and New Zealand. PTE exam is conducted almost every day at various centers across multiple cities with the facility of exam booking 48 hours prior to the test date. There is also an option to book the exam 24 hours prior to the exam by paying a nominal fee for the same. The candidate can choose his/her exam center as well as preferred time slot for the test exam. The test can be booked online at ‘https://home.pearsonvue.com/’ with a valid passport being a compulsory requirement. The exam result is declared within a period of 24 hour to 5 business days and is valid for two years. All the aforementioned parts have a pre-defined pattern which is followed. The question types for each part are discussed as below. This section assesses the ability of the candidate in both writing and speaking sections with a bunch of integrated and independent tasks. 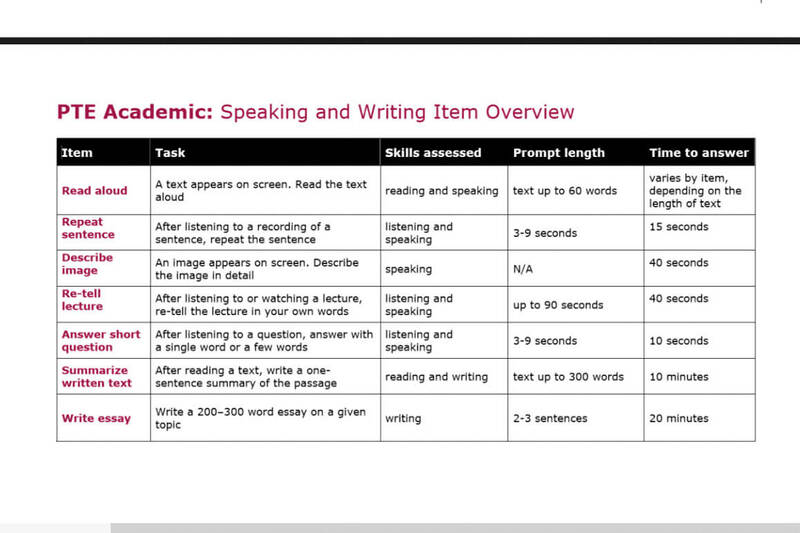 The enabling skills are used to rate performance in the productive skills of speaking and writing. The parameters on which the candidate is assessed are grammar, oral fluency, pronunciation, spelling, vocabulary, and written discourse. The scores are based on performance of only those items that specifically assess these skills with the score range for each skill being 10–90 points. The speaking section begins with a brief introduction of the candidate and is not evaluated in the overall score. As soon as it is over, questions will appear on the screen, with each question having its own time limit. A microphone will be used to record your response. Going by the title, the questions need to be read aloud; the text would be displayed on the screen. The maximum words for the reading prompt are 60, with time varying with respect to the length of the question. 30 to 40 seconds will be given to prepare the content. Stress and Intonation of your voice are vital parameters on the basis of which you are evaluated in your speaking. There would be 5-6 questions in all. With no preparation time in this segment, the sentence needs to be repeated verbatim. You need to repeat as soon as you listen to the sentence. You get credits depending on how many words have you been able to repeat exactly and in the same order. There are 10-12 items of this type. The task requires you to describe the image shown on the screen which could be a graph, diagram, map or any other general image. The preparation given for each item is 25 seconds and the responding time limit is 40 seconds. There are 5-6 questions of this variety. As per the title, an academic lecture played as an audio clip needs to be retold in the candidate’s words. The lecture starts automatically and there is a fair chance that it is accompanied by an image for better understanding. After the audio clip ends, 10 seconds are given for preparation. After 10 seconds, you’ll hear a short tone or beep that indicates the commencement of the candidate’s speaking time. There are 10-12 questions based on general awareness that need to be answered in one or a few words. There are no partial credits. The answer is either right or wrong. In both the writing tasks, your marks are awarded by taking your grammar, vocabulary, spellings, word range, punctuations and content into consideration. In summary writing, you are required to provide one sentence summary for the given paragraph. The summary should be between 50– 75 words with 10 minutes to complete it. There would be one or two essay writing questions. You will have to write an essay on a given topic. The topic would be general, not a technical one. You need to write an essay between 200 and 300 words and will be given 20 minutes to finish this task. This type involves reading the comprehension. You need to read the text provided and answer the question based on the information given in the passage. There are five options for each question; one needs to be chosen. You need to go through the given passage carefully. Right beneath the provided text is a question with multiple options. You need to select (by clicking) more than one option that according to you are the right answers. The given text could be approximately 300 words. These questions involve negative marking where a wrong answer could get you a minus mark. So be careful! Tick only those options which you are sure of. A jumbled paragraph is given on the left hand side with a blank space on the right hand side. You need to drag the paragraphs from the left side and put them in order into the blank space on the right side. You get one mark for each correct pair. Your screen will display a passage or a paragraph(s) with several blank and certain words will be provided as options at the bottom. The options will always be more than the number of blanks. You need to drag and drop a proper word in a proper blank and a point is awarded for each correctly placed word. On your screen will be a passage or a paragraph(s) with several blanks. Each blank will have a dropdown option filled with several words. You need to select the word that you think fits appropriately. This section requires you to listen to the audio or video clips that begin automatically. After every audio clip, a question(s) will follow that needs to be answered. You must make notes of the important points given in the audio. 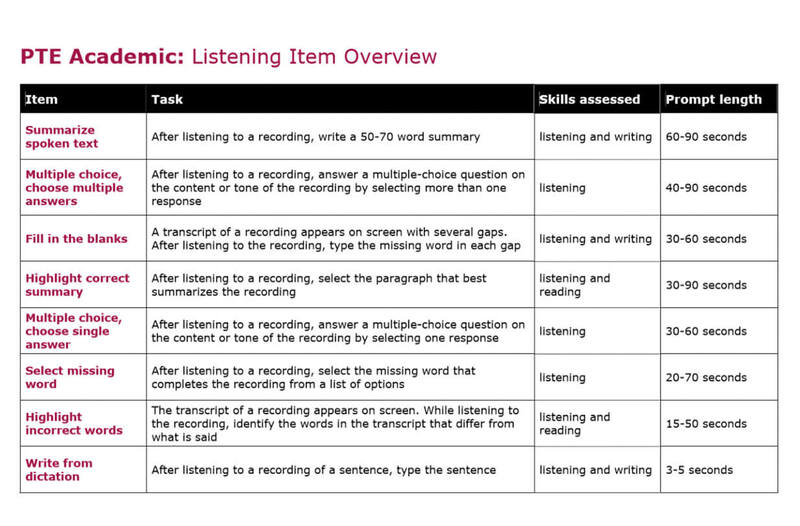 You will hear a recording and once it’s over, you are given 10 minutes to provide a written summary of the recording you listened to. You need to type the summary for the same in 50-70 words. You will hear an audio clip and you must listen to the information carefully and note down the important points as and when required. Simultaneously a question will be displayed on the screen with multiple options and you have to select multiple answers that are relevant to the text spoken. Wrong answers lead to deduction of one mark per incorrect answer. A transcript will be displayed on your screen with several blanks that to be filled. Further, you will hear an audio clip for the same transcript and you have to type in the missing word while listening to the recording. If you have good typing speed, you may type the word as you listen to the audio clip, otherwise, you may write down the missing word on your notepad and then once the clip is over, type all the words in the blanks. You will listen to an audio clip. After listening to the lecture, you will need to select the summary paragraph that best captures the main points of the lecture. You will see a question on the screen with multiple options. An audio related to that question would be played. After listening to it carefully, you need to choose any one of the text or sentences given. You will listen to an audio clip that will have a ‘beep’ at the end. You will need to select the most appropriate option that fits the ‘beep’. You have a transcript already written on your screen. You will hear an audio clip for the same transcript. You need to identify and select the words (by left-clicking on them) that are different from the words in the lecture from the audio clip. For each incorrect word selected, one mark would be deducted. It is a dictation task where you will have to listen carefully to the sentence spoken in an audio clip that is played automatically. You need to type the sentence with exact words spoken. Your score is based on the number of words written correctly.